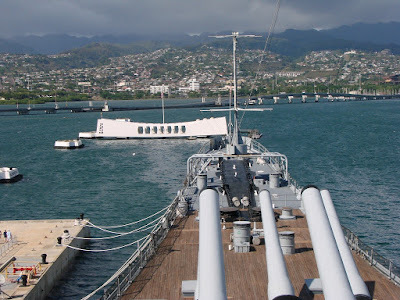 Visitors pay their respects at the Arizona Memorial as seen from the USS Missouri. The USS Arizona Memorial is the final resting place for many of the battleships 1,177 crew members who lost their lives on December 7, 1941. The memorial commemorates the site where World War II began for the United States. This ends our USS Missouri series. 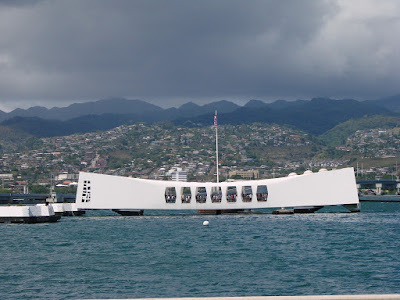 Sometime in the future we will do a more in depth series on the USS Arizona Memorial. This is the bookend of World War II shot taken aboard the USS Missouri. In the center is the Arizona Memorial which was one of the ships sank during the Japanese invasion of Pearl Harbor which triggered the US involvement in World War II. The USS Missouri is where the war ended with the surrender of Japan and now they both stand next to each other at Pearl Harbor. Side view of the USS Missouri. 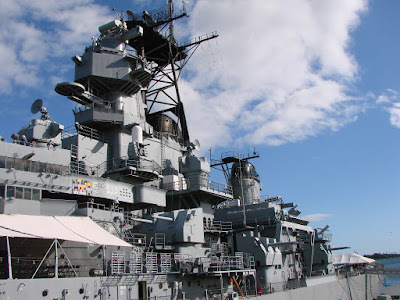 The battleship is 210 feet high and almost 900 feet long and fully loaded an carry 58,000 tons and cruise at 32 knots.